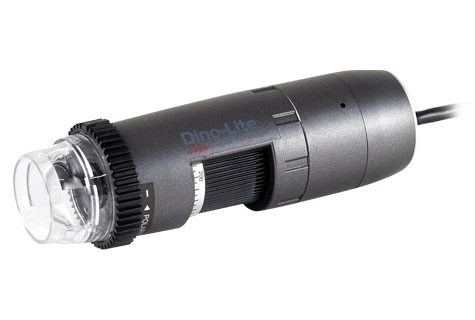 The Dino-Lite AM5212ZT is one of the latest TV-interface microscopes that feature an adjustable polarizer to help suppress unwanted glare or reflections. This Edge series is suitable for a wide range of applications including the inspection, repair and assembly involving reflective or translucent materials, with examples such as soldering, quality inspection, or jewelry fabrication. Combined with totally revamped optics and high resolution 960H, it is the latest upgrade over its predecessors such as the AM4112 and AM412 microscopes with TV output. Also, like all standard magnification models on the Edge series, this microscope incorporates a 20X to 220X magnifying range and interchangeable front caps available to suit different purposes. The current available options are close cap, open cap, diffuser cap, extended cap, long cap, and sidelight cap. The AM5212ZT does not require a computer or bundled software to operate and works simply by connecting it to a conventional TV using the supplied composite video cable. It is available in either NTSC or PAL video standards depending on your region of residence.